"Azie’s menu is much like its décor: modern, refined and decidedly Japanese, imbued with traces of European and American influences." "An unlimited brunch buffet menu from 11 a.m.–2:30 p.m., complete with carving, omelet and dessert stations in addition to a variety of brunch dishes and Asian specialties." "For more than two decades, this husband-wife duo has been a culinary powerhouse on the Main Line." The new dishes are delicious, healthy and are offered gluten free upon request. Regulars may recognize a couple of these dishes from the lunch and happy hour menus. But, because of their popularity, Chef Ricardo Franco has revamped them for the dinner menu. Azie on Main’s owners, Win and Sutida Somboonsong have established themselves as dynamic forces behind the Win Signature Restaurants. 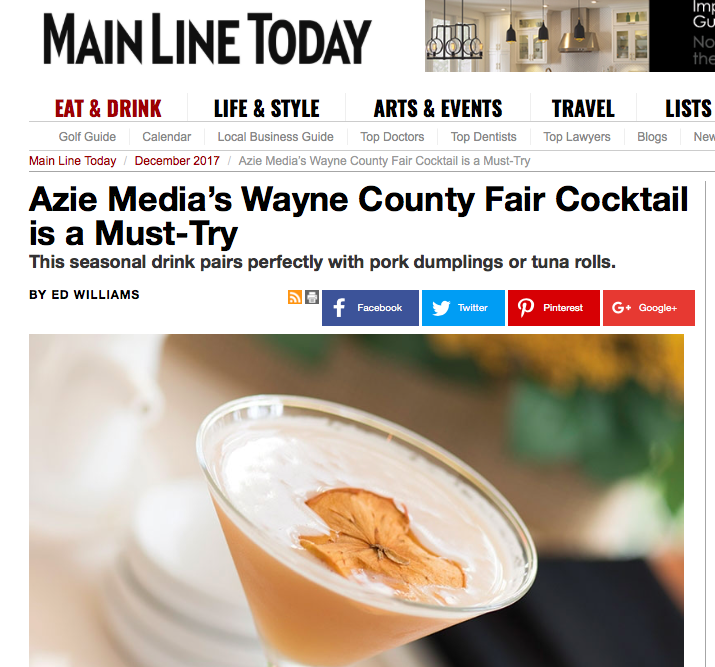 Azie in Media is also bringing autumnal touches to its creative menu with new eats like spicy tuna crostini and sake marinated black cod taking center stage. "This talented team - many of whom trained under Iron Chef Morimoto - wows diners with imaginative Asian cuisine, especially sushi. Take your pick from an extensive list of roll, sashimi, specials and a la carte selections. Stay authentic with slices of hamachi and toro, or try a unique offering like the salmon tartare." "Chef Min Koo Lee, newly arrived from sister restaurant Azie in Media, puts a fresh spin on the menu — even desserts, such as sponge truffle cheesecake with fruit and rose maple syrup." Learn more about Chef Franco here. The Villanova hot spot has redefined its cocktail program. Already renowned for its contemporary Euro-Asian fare, Azie on Main in Villanova has taken up the task of broadening its beverage program with the assistance of mixologist extraordinaire, Pablo "Papi”. Newtown Square’s Teikoku is celebrating Valentine’s Day weekend with a special à la carte dinner menu. The dishes include a tuna sashimi salad, a special spicy tuna roll, New York strip steak and halibut. "The sushi and Thai food are both among the very best in the Philly area, with creative maki combos -- like the sweet and savory strawberry, honey, and shrimp Godzilla roll." "Warm summer evenings are perfect for al fresco dining and WIN Signature restaurants Azie on Main, Azie in Media and Teikoku have opened their patios and introduced signature summer specials." Come discover our specialty dinners at Azie on Main here. Teikoku in Newtown Square has long been a favorite lunch and dinner destination to experience the striking flavors of Thailand mixed with the influence of Japanese cuisine. Now visitors can sample their favorite fare during the restaurant’s new Sunday brunch buffet. From 11 a.m. to 2:30 p.m., guests can choose Asian dishes as well as traditional American breakfast entrées. On Sunday, April 9th Azie on Main will host an intimate California Wine Dinner to celebrate the new season. The evening’s wine selections were chosen to perfectly compliment the ingredients of Chef Ricardo Franco’s six course spring menu. To find more press on WIN Signature Restaurants visit here.